I don’t recall where I saw this, which will become apparent in a minute, though I was either on twitter or an email where a company who said, get our free logo stickers. The where cartoonish shark stickers, so why not. I ordered them and had them shipped to work. A few weeks, maybe a month or more later I receive an envelope at work. I open the envelope and it contains three shark stickers. Hey, one was sporting rockets! Anyway, that is all that was in the package, no other information. The envelope only contained references to the logistics company who shipped the stickers. I now have this company’s stickers though I have no idea who they are, what their name is, or what they do. Seems like quite a waste of a promotion. It is important to be careful who use for logistics and ensure that you are representing yourself correctly. As if you don’t the people you are contacting may have no idea who you are. 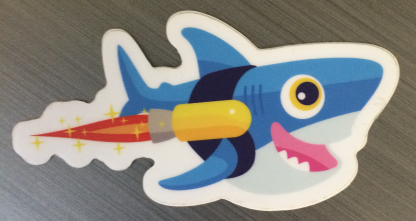 Mystery solved: The stickers are of Sammy from Digital Ocean. I figured it out by thinking of companies and googling them for stickers. :p, Silly.